A great SEO agency can get your website ranking on the first Search Engine Results Page (SERP), but what’s going to encourage users to click on that link? In many cases, it may very well be meta data. The meta description, specifically, is what Google normally shows. This is usually around 150-160 characters in length, so there isn’t much room to write. As such, the right meta description makes a big difference. 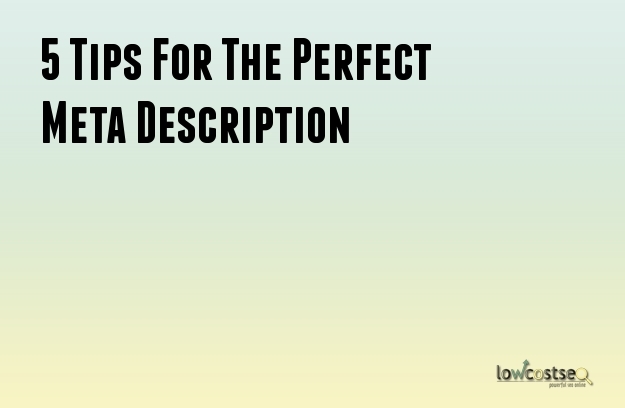 Here are 5 easy tips for writing the perfect description. With many SEO services, the right keywords count for a lot. With a meta description, you don’t want to cram these in. Instead, try and focus on the primary keyword, as the rest of the room can be used to embellish this point and make creative text. This is something that will be figured out ahead of time when planning out any website. For landing pages, product pages and other important listings, a respective, high ranking keyword will likely be chosen. For blog posts and other less important pages, it’s easier to dip into some long tail keywords to spare the link juice. Keywords aside, good meta descriptions need to be actionable. A great way to do this is to keep everything in the present. Don’t say “we can deliver” when you can simply say “we deliver”. The latter saves space and removes any potential doubt. Likewise, give the reader a reason to click the link. A call to action can be a very powerful motivational tool, encouraging people to click through when they otherwise would not. Tell people to “browse now” or “click here for exclusive offers” - so long as what you say is true – and they’ll have an extra reason to give your website a try. Also known as the active voice, it is keeping things in the present that lets readers know your website is still active and worthwhile. When you only have around 150 words to play with, space is limited. Yet you should never trail off or leave something unfinished. This looks bad on the SERP listings and doesn’t entice readers as much as a complete description does. Again, this is where a call to action is useful. Typically, these appear at the end, so readers know it is finished. “Buy now!” sounds much better than “Buy tod...”, for example. With larger websites, it’s quiet easy to run into duplicate content – this also applies to meta descriptions. This is something that can easily occur on commercial websites, where similar products may naturally have similar descriptions. Fortunately, there are a variety of tools, such as SEO Screaming Frog, that can help detect duplicate content, including the meta description. This will avoid any Google penalties, as well as ensuring any content doesn’t look duplicated, should it appear close together on the SERPS results themselves. As you can see, there are some very easy yet effective ways to perfect your meta descriptions. Today we will talk about how to optimize the Meta Description for effective SEO. This is a very important element and should not be overlooked at all in the on-page optimization process. Meta description is usually used for the search engines. The contents on them are a great source of data or information for the web crawlers. Many search engines show Meta description on its search results. So you can probably understand how important this element is in the SEO process. Well let’s talk about some guides to Meta Description today. Meta Description contains the score 3 out of total 100. The score does seem to be little but do not overlook the important of this tag in the search engine optimization process. You have make sure the Mata Description is friendly for both the potential audience and the search engines. We get many questions on how one should optimize their Meta Description properly? Click and go to Search Preferences >> Locate Meta Tags >> Locate the Description. Now in here write a summary about what your blog is actually about so that the audience can read and get an idea about it. In the case of say a blog post, you can quite simply use the Meta description in the blogger’s blog. Follow the steps below to add Meta description in a post. 1. Always make sure that you utilise the maximum 150 characters provided for Meta Description. There are many cases whereby lengthy description has not appeared in search results. Be to the point and write exactly what relates to your website page, blog or post and be sure that no important information is missed. 2. Write up a really engaging and attractive description about your site or post. Always use keywords with suitable sentences and make sure there is no repetition at all. 3. Try to limit the use of search engine stop words like Stop, And. 4. Majority of the search engines give emphasis on Meta description and they show this on the results page so always maintain to the point that you want to make with a positive approach. 5. Try to use Meta Description for each and every page of your website or blog. 6. Always maintain Keyword density of about 5%- 20% of the total words in the description. 7. Always try to use the keywords that are used in the body text. Try to follow above tips for getting effective and better results.